When Cassie’s father invites her to take time off from medical school and go on tour with the rock band he manages, she envisions traveling the world, meeting celebrities, and finally making peace with her estranged father. 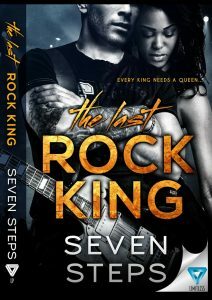 But when the rock star sets his sights on Cassie, she’s forced to make a life-changing decision. Fulfill her lifelong dream of being a doctor, or become the Rock King’s new queen? Cassie pleads with Noah and the authorities, convinced that someone with ties to the band is behind the murders—but even after an arrest, the bodies keep piling up. And that’s not all for Noah—he learns that his record label’s dropping him, his money has run low, there’s a killer targeting his fans, and his on-staff nurse has taken up permanent residence in his thoughts. It was Winter 2016. I was sitting in my in-laws living room watching the Super Bowl, when Queen's song, Somebody to Love came on. It moved me, and I knew that I had to write something about that song. The next day, sitting at work in my car, the plot came to me in the form of the song, Shutterbug by the band Veruca Salt. This book is very song driven. I knew that I wanted Cassie Washington to be sassy with big hair. I work in the medical field, so I figured she should too. Noah LaRock. Ah, Noah LaRock. Noah is everything that I want in a rock star, tough, fun, lots of energy, and troubled enough to write good music. She threw the last of her clothes in her suitcase, not bothering to send anything to the laundry. The zipper was cool on her fingers as she zipped it tight, and placed it by the door. This was it. Tonight would be the last time she would be in a fancy hotel like this. She wished that Noah was here, at least to say goodbye. They’d spent too much time burrowing into each other’s hearts over the last few days. It was hard to imagine that she would never wake up to him again. I can’t stay, she thought. It had become her mantra. I can’t stay. She closed her eyes, let out a breath. “Cas? I can hear you thinking in there,” he said. Not bothering to smooth her hair, she raced to the door, snatched it open, and threw herself into his arms. She felt him exhale a breath as he wrapped his arms around her. He kissed her ear when she let him go. In one hand he held a bottle of wine, in the other a white canvas bag. He kicked the door shut, followed her to the bed. “Oh, I hope they’re expensive,” she teased. The bed sagged under his weight. He reached into the canvas bag, and pulled out a bag of green grapes, dripping with water. He reached into the bag again, and pulled out a notebook and pen, handed it to her. Cheesy, she thought. Cheesy and perfect. “Only when I miss you,” he said, picking up the bag and putting it under the bed. He picked one grape from the bag, held it out to her. She rolled her eyes, and opened her mouth, allowing him to place the grape gently on her tongue. His eyes obsessed themselves with her lips, the way her mouth moved as it chewed. She swallowed the last of the grape, her heart fluttering when he moved in to kiss her. “I’ll miss your lips,” he whispered, before capturing them with his own. The kiss, though brief, clung to her soul. He pulled out another grape, and she opened her mouth without asking. She chewed it thoughtfully, swallowed. “I’ll miss your laugh.” He kissed her again, lingering this time. He pulled away, plucking another grape from the stem, feeding it to her. She chewed quickly, anxious for his words, his kiss. He kissed her again, his lips drawing all of her strength from her. His kiss devoured the smile that formed on her lips. He kissed along her jaw, clung to her lips again. She kissed him back with all of the love that she had in her heart as the tears dripped down her face, wetting his cheeks. That’s when she knew. She couldn’t leave. Her heart wouldn’t allow it. He shook his head, put his forehead to hers. “You can’t. You have a dream, and I’d never forgive myself if I ruined it for you. We have tonight.” He smiled, his eyes watering. His brows knit together, his mouth tight. Disappointment etched in her face, her eyes dropping. She knew he was right. Why did he always have to be so right? She thought. They laid down then, ignoring the movie that played in the background. There was no time to focus on anything else but each other. They carved into their brains the feel of each others kiss.